This is actually the first time I've painted human Princess Twilight, and what better occasion than as my entry into WeLoveFine's Friendship Day contest? If you like the design, consider rating it on their website to increase its chances of getting made into a t-shirt! otherwise, this will be ready as a print for BronyCon in a couple months! I love those eyes ! Thank you I really like how they came out! Can i use that picture to put it on my amino profile (profile picture) cause they told me that i need to credit the artist before using his art and your art is wonderful and amazing!!! Aaah. Now THAT'S the treatment my Twilie dearest deserves. Great work here, friend! It shall be preserved. haha thank you! 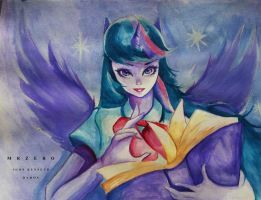 nothing but the best for Twily! ... There's something weirdly evocative about Twilight's eyes here. Like, they really seem to express the combination of (compassionately used) power and intelligence typical of the character. It's... kind of impressive <3. Your WeLoveFine connection is borked. I keep getting a 'your connection is not private' error. Can you please draw EG Sunburst and EG Cheese Sandwich!!! Plssss! I want to see how you can draw them! Thanks for the kindness!! Youre the best! Somebody redrew this without giving credit, but idk if they needed to in the first place. Here it is. Thank you for notifying me I just left a comment asking them to credit artists in the future. yeah wow, i mean WOW. well everyone else has kind of said it ,but, you know. it's really really good, you know? like really really really good.